Our group of 18 or so would meet each morning at the Santa Fe Photographic Workshops center, adjacent to St. John's College. We would sit in a bright, sunny classroom with high ceilings and tall windows - chairs arranged in a wide circle. We would begin with a half hour or so of silent meditation, and then dive into group writing practice. In this context, "writing practice" means something quite specific - timed writings using a prompt. Nat would bark out something like, "tell me about that prized bicycle you had as a kid - 20 mins - GO" (meaning don't think, write). Though more often, in this context, it was "tell me about a favorite meal you had" or "tell me why you like the coffee shop you always go to." You don't stop. You don't edit. You don't cross out. You keep your hand moving, and you're free to write the worst junk imaginable. After writing, we would put down our pens and listen, as one of us after another would read what we had written. We didn't comment on the quality of the writing, but we would engage in active "recall," repeating and noting ideas or passages that had stuck with us as each person read. Luxuriating in this kind of creative indulgence for an entire week felt decadent. And there is a powerful intimacy in getting to know a group of people solely through their writing, while pointedly excluding much of the polite chitchat and social nicety that we generally use to engage those we don't know well. W e did break silence in the late afternoon each day. And each night we separated into small groups to go forth to explore the many culinary options Santa Fe offered in furtherance of our food writing theme. It's always fun to go out in a city where I know no one (though I did, hilariously, bump into a couple of friends at one restaurant). I dined at a number of fine dining restaurants with lovely atmospheres and well prepared food. But I'm afraid that for me, these kinds of restaurants can tend to run together. The exquisite plating arrangements, the polite, well coifed servers, the ritual telling of the dessert options - it's all quite lovely. But at times it can feel fetishized and awfully formulaic. However, I did eat one particularly memorable meal. Bill and I snuck out for lunch on my birthday. 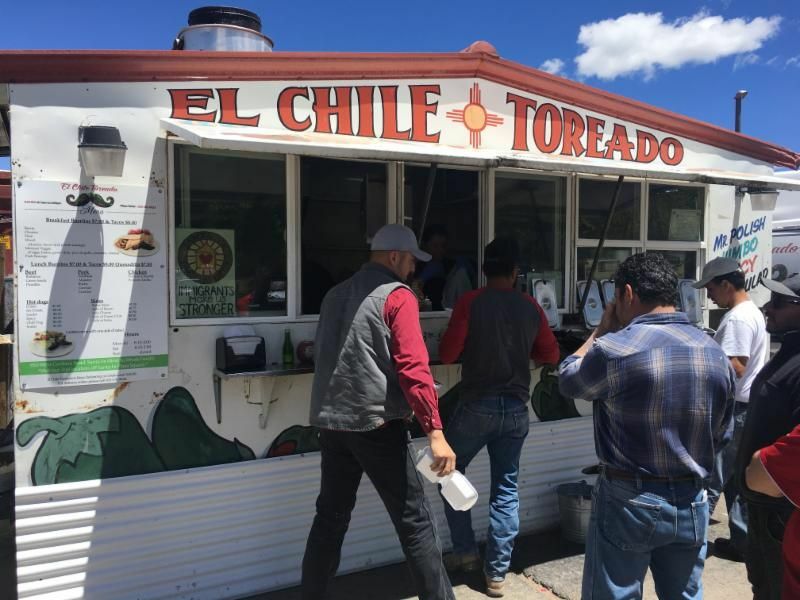 We sought out a place called El Chile Toreado, recommended to me by TFB regular and part time New Mexican, Stephen Becker. It's a tiny shack in the middle of a parking lot on the edge of a fairly industrial area - looks like a trailer that lost its wheels somewhere. I noticed one thing right away. Despite the chilly breeze, a line of folks were queued up out front. That, my friends, is always a good sign. Bill mentioned this as well. We parked as quickly as we could and jumped in line. Within minutes we were ordering cabrito and el pastor and barbacoa tacos, and tacos filled with offal varieties I didn't even want to ask about. We decorated them with salsas, cabbage, onions with cilantro, and roasted peppers from the stainless bar that clung to the window where we ordered. Then we squeezed fresh limes over all of them and took our loot out back where we bellied up to a small counter attached to the rear of the kitchen. We ate our fill and then some, huddled in the cold. We washed it all down with bottles of Mexican Coca Cola. Toreado is legit - a place where real people make real food with their own hands and look you in the eye when they serve you. Those tacos, and the folks who made them, will stick with me. When I travel, it can be hard to find the kind of humble, soulful fare that I love. I don't want to sound overly critical - the restaurant business can be brutal. But when I find a place with the kind of soul that Toreado exudes while traveling - a place where the focus is on simple, fresh ingredients and an honest exchange with the people being served - that's like striking gold. Bill and I were fortunate to locate one of those places. And I was reminded in a powerful and delicious way of the values I want to strive for back at home at TFB.